The units labeled above are currently available for sale. Additional details about each home are below. This two bedroom, upper-level home has views of the mountains and the farm, and has easy access to the Common House and parking. This is more than a condo. It is a community with many social benefits. 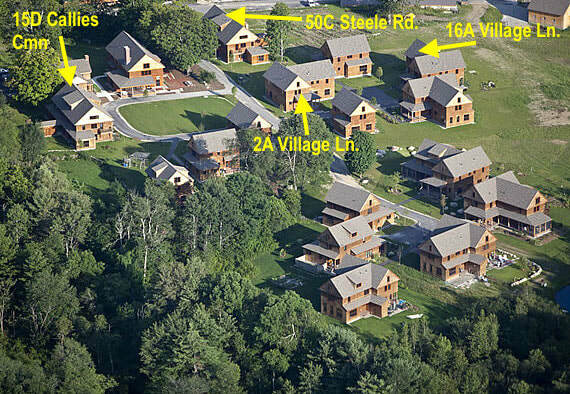 The common property is 113 acres, with a working farm, woods, fields, Common House with guest rooms, and a co-housing community which offers shared meals twice a week in the Common House. This particular condo is bright and airy . The condition is better than new, with many upgrades, like a Sub-Zero fridge, Wolff induction cooktop, Asco washing machine and dryer, but no dishwasher or oven (more drawer space, but can easily be changed). Heating is included in the condo fee which is really good value due to members contributing their time to running the heating system. The building is very high quality and well insulated. It feels warm in Winter and cool in Summer. ​To speak with someone about purchasing this home, please contact Clive at 617-875-3352 or clivexruss@gmail.com.